We assume inventory management to balance accounting and production requirements and lower inventory carrying costs for our partners. 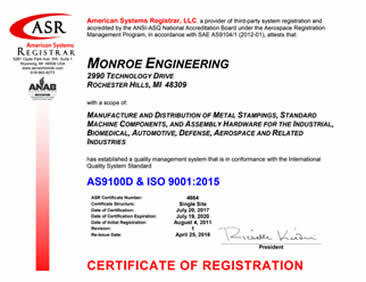 Monroe operations are compliant to ISO9001:2015/AS9100D standards. We continually strive to improve processes in the objective of offering world-class partner satisfaction. Monroe stocks and sells centers are nationwide in 5 locations to ensure close local proximity to ensure fast shipment to your business. International and domestic sourcing partners ensure we match need for value to the best source. Qualified Monroe sales engineers answer your calls and inquiries. They are empowered to provide solutions. They are trained in inventory management manufacturing solutions, and customer-centric service. They are partners-- not sales people. Our international network and vast product offerings allow us to single source multiple products, kitted in bulk. We are your purchasing partner and consultant. Monroe supports national account programs for our multi-site partners that include via world-class customer support, contract pricing and diverse distribution centers. Monroe can offer alternate product to you standard items and lower costs via our vast network of quality partners. Monroe offers EDI solutions to improve accuracy, speed and cost efficiency of exchanging po’s, invoices, shipping notices and other documents. From tank turrets to trolley wheels, from door hinges to airplane hinges, Monroe is a powerhouse in managing your manufacturing programs. Whether new business, resourcing, or reverse engineering…..we can help. Are you looking for Value Added?